The C.E.O and Technical Audiologists of KRISPAT Hearing Center, Reverend Christian Kweitsu has been conferred with an honorary Doctorate of Philosophy by Ukrainian University Vinnytsia State Pedagogical University. 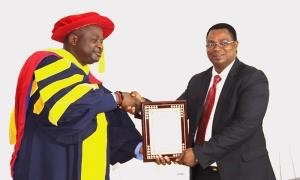 In an unveiling ceremony on Monday 15th April, 2019 in Accra, The Vinnytsia StatePedagogical University named after famous Ukrainian author, Mykhailo Kotsyubynskyj and well known both in Ukraine and abroad conferred the honorary Doctorate degree on Rev. Kweitsu for his good works in the health sector. A citation for the honour stated “This is in recognition of your enormous dedication and commitment to becoming a mogul in audiology and your efforts in ensuing the socio economic wellbeing of individuals in your country and Africa at large. Your exploits in the health sector, especially in ensuring good hearing and the supply of hearing aids to Ghanaians is worthy of commendation. Reverend Kweitsu responding to the award said “I am really honoured for the recognition, coming from a reputable institution as Vinnytsia State University. It goes to show that people and institutions monitor my works, and the services KRISPAT render”. Having existed for the past 15 years, KRISPAT Health Center is the largest hearing health center in the country and have over the years of its existence provided services like computerized hearing tests (Audiometry), middle ear measurements (Typanometry), digital hearing aids and accessories, ear protections/ swimming plugs, primary Ear Nose and Throat (ENT) care, among others.